The centerpiece of the Professional Development Package is this 245-page E-book*, a crowning achievement for my co-author and me. For years I had wanted to publish the powerful principles of Police Dynamics in a book format, but time and my job responsibilities as Sheriff just didn’t allow it. I was discussing these frustrations with my good friend, Tom Epperson, who also happens to be an accomplished writer. He suggested I just sit in front of a microphone and record the training program as if I was presenting to a live audience and he would take care of the rest. So that’s exactly what we did. Tom sat as an audience of one and I presented the entire Series 1 training program to him while he recorded it. A few months later, we had an E-book! And I have been using this book as a training resource at all of my live training conferences ever since. Coactive policing is a philosophy, not a program. Crime, as a community problem, demands a community solution. Discover how the power for effective change rests within your relationships with the citizens you serve. Then learn to apply that power to solving the problem of crime in your neighborhoods instead of just treating the symptoms. Character is the seed that produces the fruit of high achievement. Most police training programs focus on competencies, yet most of our problems pertain to character. Learn how to build trust-based relationships by re-establishing the character standard within your police organization. Discover how to build a culture of character by gaining a new character vocabulary, learning to praise character instead of achievement alone, and understanding the character test. As the cornerstone of the Police Dynamics program, the Dynamic of Authority is critical for effective law enforcement. Most instances of police misconduct are the result of ego-driven officers operating “out from under authority.” Faithfully representing the authorities over you and remaining under their protection is key to avoiding negative consequences and building essential trust-based relationships. All of the lawful authority necessary to accomplish the police mission has been delegated to your officers. This dynamic explores how easily officers give away their lawful authority and resort to ego-power. Then practical steps are presented to keep officers under authority and, in doing so, generate voluntary compliance with the law. Most officer stress stems from internal relationships. Unresolved conflicts often result in hurt, depression, anger, and jealousy. Discover the specific character qualities necessary to restore renegade officers and build healthy internal relationships as well as deal with the negative aspects of the three root character flaws: anger, lust, and greed. Simply enforcing the law might solve a crime, but it does not solve the problem of crime. Criminals often rule the streets through fear and intimidation. Learn how to reclaim criminal strongholds by tapping into the power of community relationships to reduce the fear, apathy, and tolerance for crime that enable strongholds to exist. Building trust-based relationships takes time, effort, and good character. Reduce frustration by understanding the complex dynamics involved in building vital relationships with the community you serve. The Police Dynamics E-book is crammed full of powerful information, principles, and illustrations that will help you become even more effective in your role as a professional law officer. *Immediately after your purchase, you will be able to download the E-book in pdf format. Most law enforcement organizations have a Policy and Procedure Manual. But does your agency have a Character-Based Standards Manual? Policies and procedures are valuable, but they address behavior more than the underlying motivations of the heart that we call character. This manual, or a variation of it, has been adopted by dozens of professional law enforcement and government agencies across the country to set the standard of character within their organizations. I implemented ours on my first day in office and it served as a guide for our deputies and staff for the twelve years I served as Sheriff. From a professional standards perspective, if your organization desires to hold its personnel accountable for displaying good character, then it is imperative to document those standards in a legally acceptable way. The Police Dynamics Standards Manual helps you do just that. and also addresses, sexual harassment, humor and folly, performance of duty, use of alcohol and tobacco, personal appearance standards, departmental functions, and employee recognitions. *Immediately after your purchase, you will be able to download the Standards Manual in pdf format. *You will be able to download the video series in wmv format. This short report provides a simple (although not necessarily easy) 5-step blueprint for setting a character standard within a law enforcement organization. It is a valuable resource and a great companion to the “Polishing the Tarnished Badge” video series described above. *You will be able to download this report in pdf format. This is an excellent resource for any law enforcement professional seeking to further their understanding of police integrity and ways to meet the associated challenges of building a culture of character. *NOTE: This resource is offered free of charge as a courtesy to purchasers of the Professional Development Package. It is available for free through the US DoJ COPS Office. You will be able to download this report in pdf format. I have trained police officers from all over the world for the last 15 years and I LOVE doing live Police Dynamics trainings. But now that I’m in Afghanistan serving with the International Police Coordination Board, making this information available by video and e-book is the closest I can come to live training. So take advantage of this offer now. The “Polishing the Tarnished Badge” video series is an excellent resource for short training sessions before a team deploys for patrol or as a component of an on-going character-based training program. The Police Dynamics E-book and the other resources contained in the package provide you with an abundance of material for furthering your development as a professional law officer and/or leader within our profession. Some agencies are using Police Dynamics as the basis of their promotional testing, including at least one that uses the Police Dynamics E-book as a study tool and source of exam questions. And for anyone looking for a position as a police chief, sheriff, commander, or supervisor, this resource package provides some excellent material that will prepare you for interviews, campaign speeches, public presentations, or promotional exercises. The Police Standards Manual and Setting the Standards Blueprint are valuable tools for documenting an agency’s commitment to good character and the highest standards of the police profession. As soon as your order is received, we will send you a link for instant access to the Professional Development Package I’ve just described. Feel free to contact me with any questions…. If you like this product, please share it…! "Police Dynamics seeks to fight crime by building trust-based relationships between the police and the citizens they serve through character-based principles. The program was well-received by officers and citizens alike." "While we gladly use the reduction of crime and improved personal lives as two of the benefits of positive character, I believe with all my heart that the character training my personnel have received contributed directly to the saving of lives (during a deadly rampage by an armed individual in a 75-ton bulldozer). 'The program has provided a new outlook into the behavior of my officers." 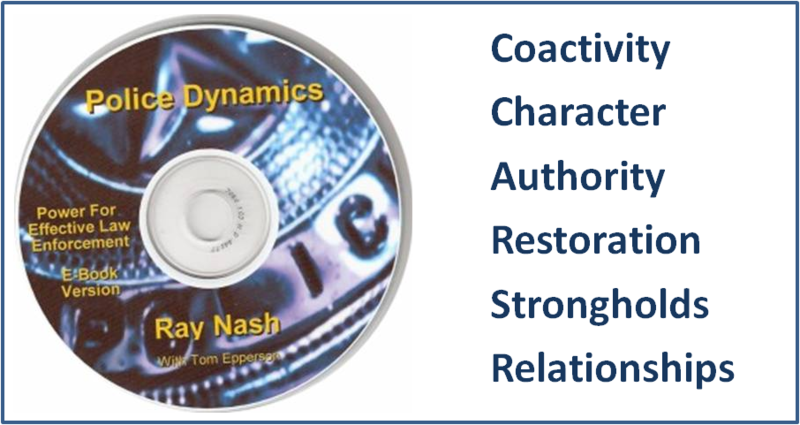 "After attending one of Sheriff Nash’s training sessions and speaking with several Sheriffs and Chiefs who implemented Sheriff Nash’s program, I am convinced of the benefits of the Police Dynamics program."